Introduced in 2014, Joya Red represented a new profile for Joya de Nicaragua, and a move away from the longer “Joya de Nicaragua” branding in favor of just “Joya.” The Nicaraguan Habano wrapper has a nice shine that looks good with the gold and red band. Flavor-wise, it’s tasty with toasty wood, cappuccino, and just a touch of pepper. Joya de Nicaragua has always been known for full-bodied Nicaraguan puros, but I’ve always felt their versatility was demonstrated by the mild Cabinetta series. 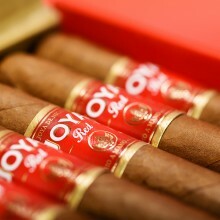 Joya Red continues to show off that versatility with tasty medium-bodied flavors at a fair price.